This is a tempting little Cyber Monday camera deals we have just noticed... B&H Photo has lopped $50 off the price of this great hotshoe flashgun from Nissin. At $99 this one-day deal is just the sort of thing to give the photographer in your family as a present, or to secretly treat yourself. 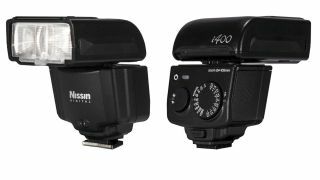 The Nissin i400 is available in five different fits - to ensure it offers TTL compatibly for practically any DSLR or mirrorless camera that you may own. Choose from Nikon, Canon, Sony, Fujifilm, or Micro Four Thirds (for Panasonic and Olympus) to make sure you have the right one for your hotshoe. This gimbal is also on offer in the UK, with £200 off its usual price - with the deal running through to the end of Cyber Monday. But if you want the New York deal from B&H you will need to act quick. Great hotshoe flash that offers a Guide Number of 131 (feet at ISO100). The zoom head can be fully tilted and rotated for bounce flash. It offers full TTL operation, but offers as range of manual power options too from 1/256 power right up to a full blast. Specify Canon, Nikon, Fujifilm, MFT or Sony when buying.